I love camping with my friends, family and all the kids in that group. That said, those kids pictured in the Orange Roll Recipe are not mine. They belong to a close friend of mine, but I have known them their entire life and we’ve been camping many times together. That said, my first kid is only 10 months old, so we have not yet had to struggle with the proper use and limits of technology in his life yet, but we are already starting to. I don’t want us to use the TV as a baby sitter or have him be one of those children that can’t go out to eat, or be anywhere without an iPad and be constantly entertained. That said, he loves his Baby Einstein videos and I don’t want to judge those parents as not having been in their shoes yet. I love technology. It’s been my work and hobbies for many years now and I am loving the amazing things it allows us to do. That said, like any tool it can be abused and misappropriated for unhealthy purposes. Just this month I’ve given up playing a video game I’ve been realizing I spend a little too much time playing. It’s about finding a balance. I recently found this image on my Facebook feed and it resonated with me. 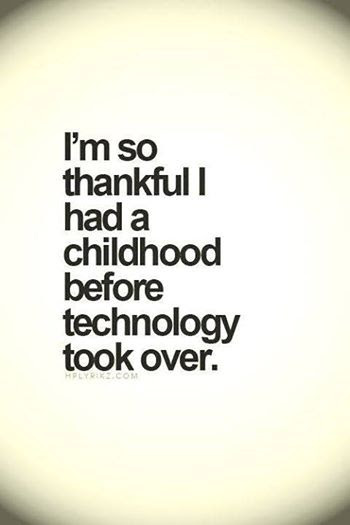 While I love technology, I am SO grateful to grow up without a lot of it. I’m so happy I got to run and play in the woods and didn’t spend time staring at a tablet. Now I did have a Nintendo growing up, and learned how to use a computer from a very young age, which I also love, but I really do cherish the “play time” I had with friends riding bikes and running around the neighborhood until the sun went down. I hope we set appropriate boundaries with our son with technology. I hope he has a wonderful curiosity about technology and wants to know how it works and how to make it work instead of just consuming or playing games. That is the struggle I see ahead of us and the balance I hope to strike. I’m already suggesting to my wife and mother not to let him play with their iPhones as he will be clamoring for such devices soon enough. I don’t enjoy seeing families with all their kids head’s buried in their devices all the time. I hope we don’t become one of those families, yet I must acknowledge we are living in a different time. I can’t even imagine how pervasive and cheap such devices will be when my son enters school. I’m all for using technology to empower our lives. I hope they find a way to use it in the classroom to help the children learn more and more efficiently, but I hope it doesn’t come at the cost of robbing their childhood of real playtime outdoors with friends and just their imaginations. I foresee us setting strict limits on screen time vs outdoor play time. I hope to take my son camping often and all over so he can learn to appreciate the great outdoors and all it offers. I hope we can find the right balance of using technology to empower our lives and not wasting it away consuming nonsense. So what is your balance with technology? 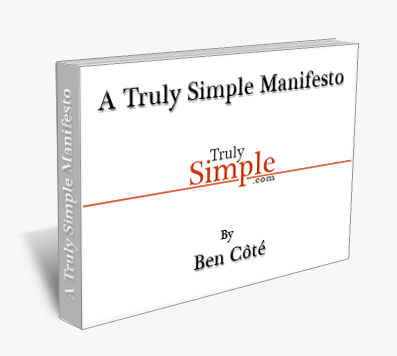 Do you take a technology Sabbath and put the phones away for a while? Do you limit your own or your kids screen time? I would love to hear what ideas and solutions you’ve implemented in your house.